Researchers at National Jewish Health have discovered a novel genetic mechanism of immune deficiency. Magdalena M. Gorska, M.D., Ph.D., and Rafeul Alam, M.D., Ph.D., identified a mutation in Unc119 that causes an immunodeficiency known as idiopathic CD4 lymphopenia. Unc119 is a signaling protein that activates and induces T-cell proliferation. The mutation impairs Unc119’s ability to activate T-cells. Dr. Gorska presented the findings on April 20, 2012 at Translational Science 2012, an NIH-funded conference in Washington D.C. “A better understanding of the molecular mechanisms associated with this mutation will improve diagnosis and pave the way for development of new therapies,” said Dr. Gorska. Drs. Gorska and Alam previously published their findings in the February 9, 2012 issue of Blood, and Dr. Gorska delivered a Presidential Plenary lecture on the topic at the annual meeting of the American Academy of Allergy Asthma & Immunology. Nearly a decade ago, Drs. Alam and Gorska identified Unc119 as a novel activator of SRC-type tyrosine kinases, important regulators of cellular function. Since then, they have published numerous papers in which they characterized the function of this protein in various aspects of the immune system. Idiopathic CD4 lymphopenia is a rare and heterogeneous syndrome defined by low levels of CD4 T-cells in the absence of HIV infection, which predisposes patients to infections and malignancies. Recent research by others had linked the syndrome to reduced activation of the SRC-type kinase known as Lck. The latter kinase is involved in T-cell development, activation, and proliferation. So, Drs. Alam and Gorska thought Unc119, an activator of Lck, might be involved. The development of more effective cancer drugs could be a step closer thanks to the discovery, by scientists at Warwick Medical School, of how an inbuilt ‘security check’ operates to guarantee cells divide with the correct number of chromosomes. Most cells in our bodies contain 23 pairs of chromosomes that encode our individual genetic identities. The process of chromosome segregation is monitored by a system called the spindle checkpoint that ensures daughter cells receive the correct number of chromosomes. If daughter cells receive an unequal number of chromosomes, known as ‘aneuploidy,’ this drives normal cells to become cancerous. Indeed, the cells of aggressive human tumors are frequently ‘aneuploid’ with many components of the spindle checkpoint being mutated or mis-expressed. Therefore, determining how the spindle checkpoint operates is vital to understanding what causes, and what can prevent, the formation of tumors. On April 19, 2012, online, Current Biology published research by Professor Jonathan Millar at the University of Warwick, UK, and colleagues, that pinpoints the precise mechanism by which spindle checkpoint proteins bind chromosomes. 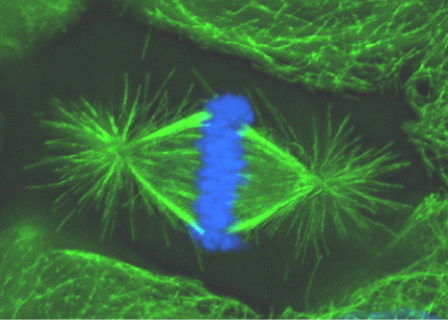 Professor Millar explained, “Components of the spindle assembly checkpoint were first discovered 22 years ago by researchers in America and yet, until now, the binding sites for these proteins on chromosomes have remained unknown. We have been able to answer this question and as a result, we are now in a much better position to design more selective and effective drugs.” Currently, some of the most frequently used anti-cancer drugs are taxanes, which prevent proper inactivation of the spindle checkpoint and result in selective death of cancer, but not normal, cells. The virulence of plant-borne diseases depends not just on the particular strain of a pathogen, but on where the pathogen has been before landing in its host, according to new research results. Scientists from the University of California System and the U.S. Department of Agriculture's Agricultural Research Service (USDA ARS) published the results on April 18, 2012 in PLoS ONE. The study demonstrates that the pattern of gene regulation--how a cell determines which genes it will encode into its structure and how it will encode them--rather than gene make-up alone affects how aggressively a microbe will behave in a plant host. The pattern of gene regulation is formed by past environments, or by an original host plant from which the pathogen is transmitted. "If confirmed, this finding could add a key new dimension to how we look at microbes because their history is going to matter--and their history may be hard to reconstruct," said Dr. Matteo Garbelotto, an environmental scientist at the University of California, Berkeley, and co-author of the paper. Epigenetic factors--for example, gene regulation mechanisms controlled by diet or exposure to extreme environments--are well known to affect the susceptibility of humans to some diseases. 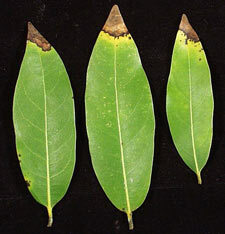 The new study is the first to show a similar process for plant pathogens. "Sudden oak death, for example, is one of many pathogens that seemingly came out of nowhere to ravage the forests of California," said Sam Scheiner, a director of the National Science Foundation's (NSF) Ecology and Evolution of Infectious Diseases (EEID) program, which funded the research. "This study shows that such sudden emergence can happen through rapid evolution, and may provide clues for predicting future epidemics." The EEID program is a joint effort of NSF and the National Institutes of Health. Studying a mouse model of Alzheimer's disease, neuroscientists at the Technische Universitaet Muenchen (TUM) have observed correlations between increases in both soluble and plaque-forming beta-amyloid – a protein implicated in the disease process – and dysfunctional developments on several levels: individual cortical neurons, neuronal circuits, sensory cognition, and behavior. Their results, published April 10, 2012 in Nature Communications, show that these changes progress in parallel and that, together, they reveal distinct stages in Alzheimer's disease with a specific order in time. In addition to its well-known, devastating effects on memory and learning, Alzheimer's disease can also impair a person's sense of smell or vision. Typically, these changes in sensory cognition only show themselves behaviorally when the disease is more advanced. A new study sheds light on what is happening in the brain throughout the disease process, specifically with respect to the part of the cerebral cortex responsible for integrating visual information. A team led by Professor Arthur Konnerth, a Carl von Linde Senior Fellow of the TUM Institute for Advanced Study, has observed Alzheimer's-related changes in the visual cortex at the single-cell level. Using a technique called two-photon calcium imaging, the researchers recorded both spontaneous and stimulated signaling activity in cortical neurons of living mice: transgenic mice carrying mutations that cause Alzheimer's disease in humans, and wild-type mice as a control group. By observing how neuronal signaling responded to a special kind of vision test – in which a simple grating pattern of light and dark bars moves in front of the mouse's eye – the scientists could characterize the visual circuit as being more or less "tuned" to specific orientations and directions of movement. Dr.
Scientists have identified a link between different strains of malaria parasites that cause severe disease, which could aid the development of vaccines or drugs against life-threatening cases of the infection. Researchers have identified a key protein that is common to many potentially fatal forms of the condition, and found that antibodies that targeted this protein were effective against these severe malaria strains. The protein has sticky properties that enable it to bind to red blood cells and form dangerous clumps that can block blood vessels. These clumps, or rosettes, can cause severe illness, including coma and brain damage. 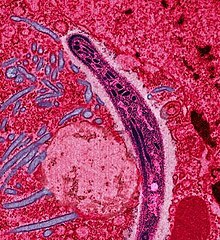 Presently, between 10 and 20 per cent of people with severe malaria die from it, and the disease – which is spread by blood-sucking mosquitoes – claims about one million lives per year. Malaria parasites, once in the bloodstream, are able to alter the protein molecules on their surfaces to evade attack by the immune system. These surface proteins are usually poor targets for treatments or vaccines because they are highly variable between different malaria parasite strains. Now, researchers have found that the surface proteins of rosette-forming parasites share similarities that may allow them to act as a target for treatments to block progress of the disease. Scientists from the University of Edinburgh worked with collaborators from Cameroon, Mali, Kenya, and Gambia to test their antibodies against parasites collected from patients. The study, published on April 19, 2012 in PLoS Pathogens, was supported by the Wellcome Trust. A new approach to investigating hard-to-find chromosomal abnormalities has identified 33 genes associated with autism and related disorders, 22 for the first time. Several of these genes also appear to be altered in different ways in individuals with psychiatric disorders such as schizophrenia, symptoms of which may begin in adolescence or adulthood. Results of the study by a multi-institutional research team were published online on April 19, 2012 in Cell. "By sequencing the genomes of a group of children with neurodevelopmental abnormalities, including autism, who were also known to have abnormal chromosomes, we identified the precise points where the DNA strands are disrupted and segments exchanged within or between chromosomes. As a result, we were able to discover a series of genes that have a strong individual impact on these disorders," says James Gusella, Ph.D., director of the Massachusetts General Hospital Center for Human Genetic Research (MGH CHGR) and senior author of the Cell paper. "We also found that many of these genes play a role in diverse clinical situations – from severe intellectual disability to adult-onset schizophrenia – leading to the conclusion that these genes are very sensitive to even subtle perturbations." Physicians evaluating children with neurodevelopmental abnormalities often order tests to examine their chromosomes, but while these tests can detect significant abnormalities in chromosomal structure, they typically cannot identify a specific gene as being disrupted.